Place the duck legs on a baking sheet and warm for 15 minutes in the oven at 190 °C (375 °F). In the meantime, arrange the cucumber slices in the centre of 6 medium plates, overlapping them slightly. Set aside. 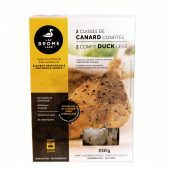 Remove the duck legs from the oven and remove the skin. Pull the meat from the bones with your hands and set aside. 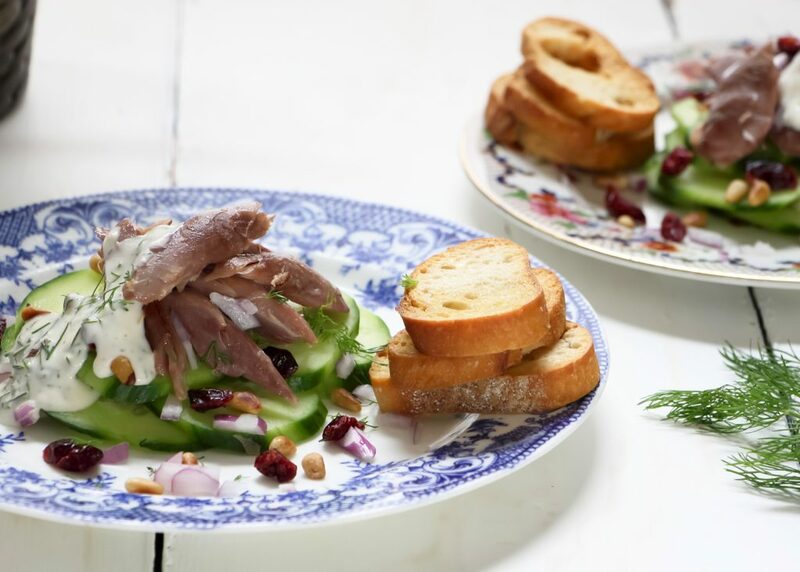 Pour some creamy dill dressing over the cucumbers and add the duck confit pieces. Top with the dried cranberries, pine nuts, and chopped red onion. Drizzle a little more creamy dill dressing over each serving and serve immediately with toasted slices of bread.